Leading PNG referee Paul Wani has been appointed by the RLIF to officiate at the EastAsia Cup International Test match between Hong Kong and Japan this Saturday June 16,2018. Paul becomes the 2nd Papua New Guinean after Graham Ainui who was our last international referee more than 26 years ago. 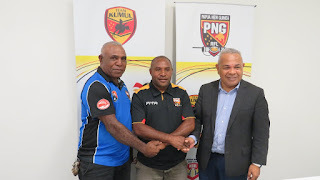 Paul was spotted by RLIF NRL manager Tas Battieri during the Rugby League 9s competition at the 2015 Pacific Games in Port Moresby and earlier this year was recommended to take charge of this International match.“We gladly accepted the recommendation which was approved by the RLIF,” Rau said. Rau extended PNGRFLs gratitude to the RLIF for this important appointment. Referees Director in PNG Joe Peregua will accompany Paul to Japan. Both men leave on Friday. The East Asia Cup Test match will be played on Saturday afternoon at the Irangi Comprehensive ground in Tokyo. They return on Tuesday June 19, 2018. “On behalf of the PNGRFL Chairman Sandis Tsaka, Board and the rugby league community in PNG, we wish Paul all the best in refereeing his 1st International Test match and hope he has a good game.